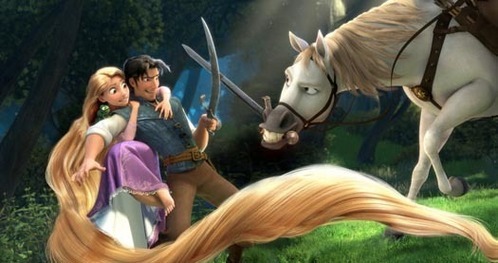 Where is Tangled on your favorite DP movie list? Do any of you know the real version of the rapunzel stories? I love how curious she was about the human world and the lanterns. She stands up for herself when needed. She's very active, dreamy, self-sacrificing, kind, friendly, intelligent and sometimes funny. She can also get along with people easily. I also love how she was able to prove Mother Gothel wrong. Also how much she was struggling to save Eugene by sacrificing herself. The whole day passed boring without seeing Rapunzeñ at least once. It was 6:45 and the whole family was there already. One of Eugene’s uncle was there too, and he liked to tease and scare him a lot. The reason why everyone gathered up was because it was his aunt’s birthday. Eugene didn’t want to join but he had to. It was 1:32 already and Eugene said he began to feel sleepy. They let him to go to bed and when he entered his bedroom he phoned Rapunzel. I haven't written for like a year now and that's creepy. Alright so when I was a kid I loved Disney. I was so enchanted by their stories and the music that goes with each film. In the 1990s Disney was the best in this year. The Lion King was my all time favourite film as a kid and now holds the No#2 spot on my countdown for my fav movies overall, Pocahontas was great,heck even the likes of Aladdin and Beauty and the Beast were brilliant movies. a comment was made to the poll: Which do you like better? Where is Rapunzel placed on your Favorite DP list?